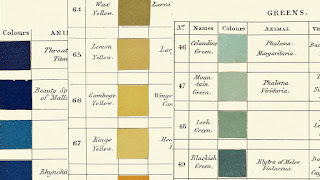 Colossal introduces us to the colour-classification system that was devised by a German geologist called Abraham Gottlob Werner to create a standardised nomenclature for describing minerals and then expanded by Scots painter Patrick Syme to include subjects for students of Nature in 1814—which the Smithsonian is reissuing. 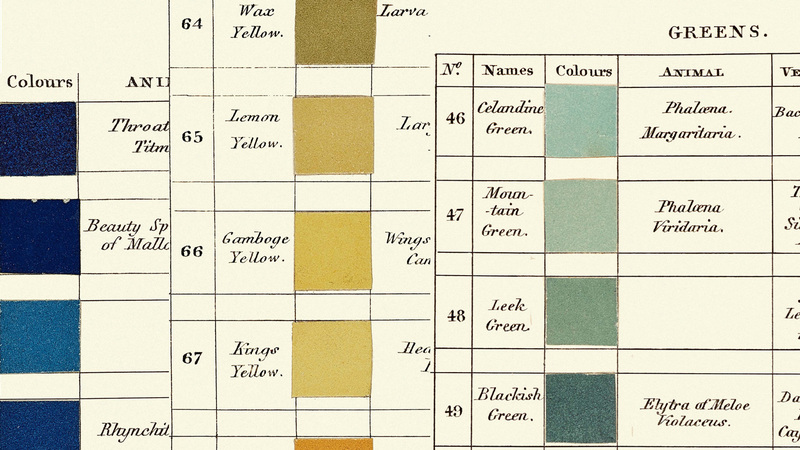 Each poetically-named hue cites occurrences in the animal, vegetable and mineral domains, and a copy of this volume accompanied Charles Darwin on his journeys in the HMS Beagle. Like with the rich and precise language that heralds use to describe armorial bearings, before photography and the general portability of information, accuracy of transmission was paramount for identification and faithful reproduction.